We are back at Pegasus every second Tuesday for another year, our eleventh! The next performance is this upcoming week, on January 31st. Stay tuned for a celebration of ten years at the restaurant, upcoming in March. Also in the plans for 2012 are return visits to Ontario and BC, and possibly Manitoba. There is also an outside chance some of us will travel to Greece in October. A couple of years ago, we ran out of copies of our first two CDs, Architects of Narghile (2001) and Dinner in Polidroso (2004). Rather than reprint them in these download-happy times where it is now much harder to sell CDs, we decided to let them go out of print and concentrate on marketing our latest release, Kafeneion. But recently a very few shrink-wrapped, untouched copies surfaced. If you are interested in acquiring them, send us an email at thehipsters@rembetika.com. These won't last, so act quickly. Makes a fabulous Christmas gift, I'm sure! Also! Jonathan Lewis has compiled a selection of tracks from these two CDs on a best-of CDR. And he remastered them so they sound better than ever. And he added an out-take from Kafeneion, our version of an old rebetiko song, Arrostisa Manoula Mou, unavailable anywhere else. Any of these items are $20 Canadian. A nice piece courtesy of Mike Bell in the June 18, 2011 Calgary Herald. Calgary band the Rembetika Hipsters have released a new album, Kafeneion. It’s their first in six years. It is what every rock band dreams of: a sponsorship deal with a booze company. Jagermeister, Jack Daniels, Heineken or even Molson Canadian or Pilsner are usually at the top of the list. But what kind of booze sponsorship does a rembetika band hope to land? Apparently Metaxa, the Greek brandy and wine spirit. So mission accomplished and dream come true for local vets Rembetika Hipsters, who recently signed a promotional and sponsorship deal with the liquor that they almost single-handedly kept in business during the band’s regular Wednesday night residency at former 14th Street eatery Pegasus. And, again, it’s fitting, especially considering that after a year layoff, the Hipsters have just started up the residency again in Pegasus’s new location in Altadore (4824 16th St. S.W.). Every second Tuesday, the mainstays of the Calgary folk and world music scene will sit, eat, drink and play their traditional and untraditional rembetika material, in a whole different setting. 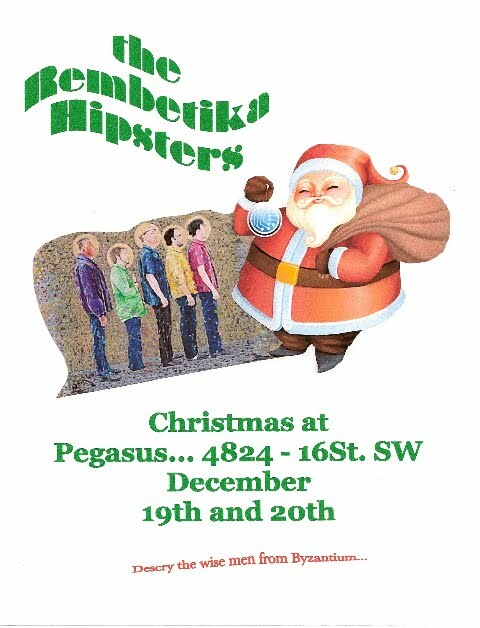 For those patrons who’ve lost track of the band during the past year, they’ll be rewarded the next time they see them — be it at Pegasus, or tonight at Mikey’s Juke Joint — with some new material from the Rembetika Hipsters’ latest release Kafeneion, which features 13 originals, covers and reworkings of past compositions. The album, their first disc in six years, features the latest incarnation of the band once more offering its exotically intoxicating take on the rembetika sound — a traditional urban Greek style, often referred to as that country’s blues. They also take it further this time, delving into other musical leanings of the region and exploring them with their western sensibilities, while still staying true to the spirit they wanted to capture when the Hipsters were formed in the mid-’90s by friends Nick Diochnos and Allen Baekeland. For Lewis, who also produced the album, the recording allowed him to show how much he’s learned and grown over his seven years with the band, which recruited him after the departure of a longtime member with a high-profile Jack Singer date looming. The musician admits adapting to the foreign style was made a little easier because of his role in local faves The Plaid Tongued Devils, whose sound, itself, is a worldly blend of folk, klezmer, ska and pop. But he also says getting into the Hipsters swing provided its own inherent learning curve, steeped in history as it is. “It’s something different for me to study, in terms of from an intellectual sense. There’s always lots of challenges with the Devils, too, but it’s a different challenge tackling a music that’s 100-plus years old,” he says. Perhaps that’s why, since teaming up with the band, Lewis has immersed himself in the music to the extent that he’s travelled to Greece five times, including to train with a noted violin instructor fluent in particular folk style he’d found himself drawn to, and one which he incorporated into Kafeneion and his pair of original compositions. And as an added bonus, Lewis and his Hipster cohorts also toured Greece, so he could see first-hand the native reaction to what they had lovingly appropriated from the Mediterranean nation. “I found in Greece people are remarkably welcoming of it. And usually pretty shocked that anybody other than a Greek is interested in this music. “Nick, for example, recently connected with the son of a famous composer of rembetika music, Vassilis Tsitsanis,” he says of the late musician, who was a huge celebrity in Greece before his death. “He was so excited about this band on the other side of the world playing his father’s music that he sent Nick a giant package . . . full of CDs and books and everything about his dad. He was so excited. “Most people see it that we intend well and we respect it,” he continues. 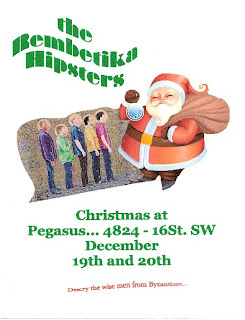 Rembetika Hipsters perform tonight at Mikey’s Juke Joint and every second Tuesday at Pegasus, including this week. 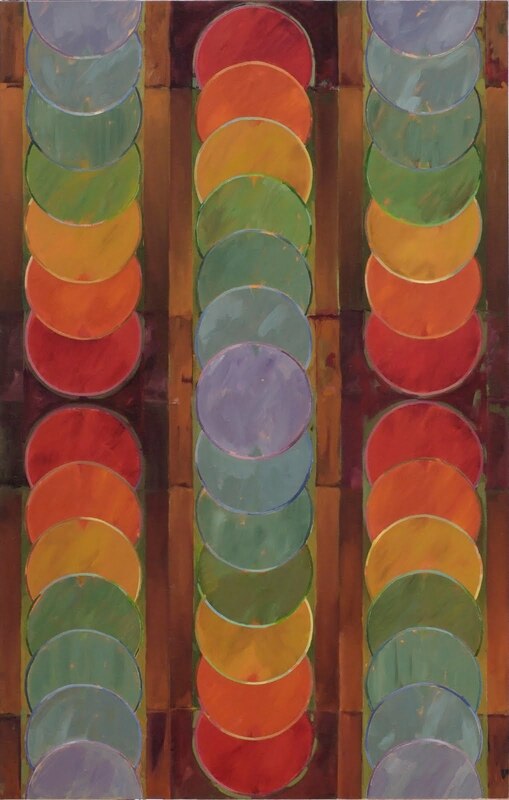 Our great friend Illyas Pagonis, who painted the portrait of the band that adorns the cover of our new CD Kafeneion, has a new exhibition of abstract works starting this week at Virginia Christopher Gallery in Calgary. Some of the Rembetika Hipsters will be at the opening on Thursday May 19 5:30 to 8 PM playing songs for the assembled art-lovers. This means you, CJSW, CKUA, CBC, CILU, CIUT, CJSR, CKXU and so many others! Ευχαριστω!